When Patricia Ahern took over as president and CEO of Rainbow Hospice and Palliative Care in Park Ridge, Ill., 18 years ago, the organization had 30 employees and served 500 patients annually. By 2013, under Ahern’s leadership, Rainbow had grown to 240 employees and served 11,500 people annually. Now, Ahern, a lifelong resident of the Chicago area, has left behind her beloved Cubs and deep dish pizza to take the reins of the much larger Center for Hospice and Palliative Care in Cheektowaga. 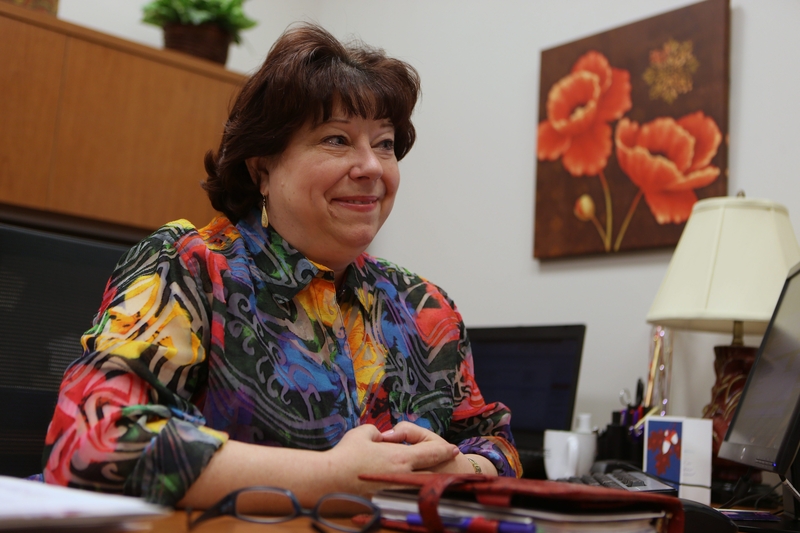 She hopes to bring stability to the organization, which was a leader in the national hospice community but is on its fourth chief executive since 2010. Ahern, who worked as a critical-care nurse before earning her MBA, talks about helping people die with dignity, and about making hospice care part of everyday conversation and not something to be put off until it’s too late. She started her new job on St. Patrick’s Day, eschewing the CEO’s office in the administration building for modest digs in the center’s clinical offices – to send the message that she wants to be closer to front-line employees. The outsider said she’s struck by how friendly Western New Yorkers are – and by how much we talk about the traffic, even though she says we don’t have any. Stephen T. Watson: Is it hard to keep a positive attitude while working in end-of-life care? Patricia Ahern: It really is not. I get that question a lot. You can imagine, you go to a cocktail party, someone will say, “What do you do for a living?” “I work at a hospice.” “Oh...” Actually, it’s inspiring work. You get to see families pull themselves together. You get to see patients who have completed their lives wrap things up in a very dignified way. You get to provide the symptom relief and the good days that are needed. SW: How did Rainbow Hospice grow so much on your watch? PA: We really focused very carefully on the community. We adopted the idea that death and dying is not so much of a medical event as it is a life event. When you think it about it that way, that it’s a life event, then you had better become part of the fabric and the complexion of the communities where people live. Because they don’t spend most of their time dying and they don’t spend most of their time in hospitals or nursing homes. They live their lives in the community. So we focused very much on showing up. We joined the chambers of commerce. We joined the Rotary clubs. The Kiwanis clubs. We did public art festivals. We did stuff that made people understand and appreciate that we weren’t just about the sad days. We were about the every days. SW: You spent your entire career in the Chicago area. Why make the move to Buffalo? PA: Buffalo was always one of very, very few, extremely well-regarded, highly respected hospice programs in the nation that I always thought, if a call came, I would listen. Buffalo really set the pace for all of the rest of us. In Chicago, at Rainbow, when we would work on our periodic strategic plans, we would look to see what Buffalo did. Yes. We would do what Buffalo had done. So Buffalo was always the early innovator. One of the first inpatient units. One of the first to have a campus. You were one of the first to have a medical director. SW: That’s a big decision to make. What made the timing right for you? SW: What do you see as areas of improvement for the center here? PA: This is an organization that’s a little fatigued, in terms of CEO turnover. I think I’m the third in 3½ years. And so there’s some fatigue there. And there’s a need for some healing. There’s a need to rebalance, to make sure that what we said we were going to do strategically is what we’re actually doing. We need to be sure that we’re focused on thriving, not surviving. And a little bit of bunker mentality that I’m so eager and confident that I can help them with. There’s so much potential here – so much talent. SW: Financially speaking, what shape is the center in? PA: I think they are in an investment period. I think that now it’s feeling like we should have probably invested in our inpatient unit sooner. We are rebuilding what they call the hospice inpatient unit. It won’t be finished until October. It’s a major renovation project and it’s probably a year or two late. They are also investing to a great degree in electronic medical records. They had an EMR (electronic medical record) but they were extremely unhappy with it. SW: Are there still misconceptions about hospice and palliative care? PA: There still is the thinking, especially on the hospice side, that hospice is the last choice, right? It’s the last resort. My goal is to help consumers and health care professionals think of hospice instead as the final reward. Let this be the reward for a life well led, that you get this kind of care. Palliative care is thought of still, maybe, as a little associated with hospice care. So people aren’t quite sure what to do with that alphabet soup. They’re different. You can have palliative care well, well, well before your options are reduced to nothing else that can cure you. SW: Not enough people have advance directives, such as a do not resuscitate order, right? PA: I’m not sure what the statistics are in New York, but in Chicagoland, less than 40 percent of Chicagoans have advance directives. It’s not a simple solution. Some people say, well, the doctors don’t want to talk about it. Some people say the patients and the families don’t want to talk about it. The truth is, none of us want to talk about it. The problem is that it always feels like it’s too soon to talk about this stuff, and then it’s too late. SW: What does it mean to have a good death? PA: I don’t know about you, but I want to be in my La-Z-Boy, with my chocolate Lab at my feet, and I want Aerosmith on. I don’t want to be in a hospital, tethered to equipment and suffering the indignities of hospitalization. And so I think there’s plenty of room to improve in this regard.